Recognized worldwide as a pianist of virtuosity and poetic poise, Imogen Cooper has established a reputation as one of the finest interpreters of the classical repertoire. She has dazzled audiences and orchestras throughout her distinguished career, bringing to the concert platform her unique musical understanding and lyrical quality. and with the Britten Sinfonia play/directing Beethoven. Following successful debut recitals in San Francisco and at Carnegie Hall in New York in May 2006, she made her solo recital debut in the Orchestra Hall in Chicago the same year. 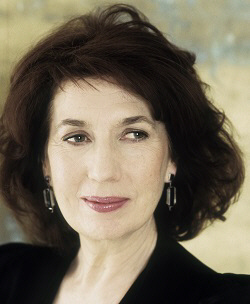 Imogen Cooper also performs extensively as a soloist and chamber musicians in the UK, France and the Netherlands. Imogen Cooper has a widespread international career and has appeared with the New York Philharmonic and Boston Symphony Orchestra with Sir Colin Davis, and the Vienna Philharmonic Orchestra with Sir Simon Rattle. She has also performed with the Royal Concertgebouw, Leipzig Gewandhaus, Dresden Staatskapelle, the City of Birmingham Symphony Orchestra and NHK Symphony Orchestras and undertaken tours with the Camerata Salzburg, Australian and Orpheus Chamber Orchestras. Imogen Cooper has played with all the major British orchestras including the Philharmonia with Christoph Eschenbach and the London Phiharmonic Orchestra with Mark Elder at the BBC Proms. She also works regularly with the Northern Sinfonia with whom she has a long term project of playing/directing Mozart Concerti. Imogen Cooper has given recitals in Paris, Vienna, Washington, Philadelphia, Rotterdam, Prague and at London’s Wigmore and Queen Elizabeth Halls. As a supporter of new music, Imogen Cooper has premiered two works at the Cheltenham International Festival: Traced Overhead by Thomas Adès (1996) and Decorated Skin by Deirdre Gribbin (2003). In 1996, she also collaborated with members of the Berlin Philharmonic Orchestra in the premiere of the quintet, Voices for Angels, written by the ensemble’s viola player, Brett Dean. Imogen Cooper is a committed chamber music player. As a Lieder recitalist, she collaborates with Wolfgang Holzmair, in what has been hailed as ‘one of the greatest living partnerships in song’ (The Times, March 2002). They have performed recitals in major venues including Vienna, Paris, London and Frankfurt, and have worked together in a Mozart-Schubert-Mahler project with the Scottish Chamber Orchestra. For Philips Classics they have recorded Schubert’s Schwanengesang, Winterreise, Die schöne Müllerin, a selection of Lieder and songs by Haydn and Mozart and Beethoven (An die ferne Geliebte), and Schumann’s Heine Lieder. Their disc of songs by Clara Schumann and Robert Schumann’s Kerner Lieder was shortlisted for the Gramophone Awards in 2002, and their most recent release is a disc of Lieder based on settings of the poems of Eichendorff. Imogen Cooper also performs and records frequently with the cellist Sonia Wieder-Atherton; they have recorded works by Rachmaninov, Fauré, Franck and Schubert for BMG France and a 2-CD box set of Brahms sonatas and Bach will be released in 2007. She also performs regularly with the Belcea Quartet. Her solo discography includes six CDs of the piano works of Schubert’s last six years, for Ottavo recordings. A CD box set entitled “Imogen Cooper and Friends” encompassing solo, chamber and lieder works has been released by Philips. For Avie, she has recorded Mozart’s Concerti Nos. 9 and 23, playing/directing the Northern Sinfonia. Imogen Cooper has no upcoming tour dates. Please check back soon.